2016 Porsche 911 Carrera 4S review | What Car? The 911 Carrera models are the bedrock of the Porsche range, so any revision to them, no matter how small, is a significant one. However, the new Carrera 4S we’re testing has undergone a seminal change, in that the old model’s naturally aspirated 3.8-litre flat-six engine has been replaced with a smaller, twin-turbocharged 3.0-litre one. The downsizing has come about in part to meet new emissions regulations, and as such a new Carrera 4S with a manual gearbox sees a drop in fuel consumption of 11%, plus 12% lower CO2 emissions than the outgoing model. If that reads a little dry for what’s meant to be an exciting sports car, fear not: it’s faster, too. There’s a modest 20bhp hike in power, and a substantial 44lb ft boost in torque. Other technical changes include a more responsive four-wheel-drive system, tweaked stability control software, and new options, including rear-wheel steering for more agile handling, plus an adjustable front ride height to make speed bumps less daunting. The styling is similar to before, with a new rear spoiler, bumpers and headlights emulating the rest of the refreshed Porsche 911 range. The 4S models are further distinguished by a horizontal light bar between the new rear tail-lights. Inside, there's a more usable new infotainment system with online features such as real-time traffic reports and satellite maps. Apple CarPlay is also standard, so you can use your iPhone through the higher-definition 7.0in touchscreen, but there’s no Mirrorlink for Android phones. What does all this cost? Well, the price has swollen by around £2500 taking the 911 Carrera 4S Coupe to £90,843, with the Cabriolet and Targa versions a whisker under £100k. So is it better to drive than the old model, and should you choose one over a Jaguar F-Type R AWD or BMW i8 Coupe? What’s the 2016 911 Carrera 4S Coupe like to drive? The crucial issue is that engine: is it any good, and does it still sound like a 911 should? Yes, and yes. Unlike the old car, which you had to rev beyond 4000rpm to get any real zing from, this new car is really punchy from just 1500rpm. Being turbochared means you don’t get the instant response you got from the old car the second you prodded the accelerator; however, after just a momentary pause the new car picks up and surges you forward with even greater ferocity, not letting up until it hits around 6500rpm. Thankfully, all the glorious noises the old car made are still there. If you opt for the switchable sports exhaust, it echos around the cabin and outside with added volume, too. It’s less pantomime than the F-Type’s V8 soundtrack, but no less enthralling. Another option worth considering is the Sport Chrono Package. This adds a rotary switch to the chunky steering wheel, similar to the one you’ll find in the 918 hypercar. It allows you to pick from four different driving modes, and if you have the optional PDK dual-clutch auto gearbox fitted, it includes a Dynamic Response button as well. Should you spy an overtaking opportunity, press this and whatever mode you are in, the engine and gearbox are cranked up to the maximum for 20 seconds to give better response. We drove both the manual and PDK versions, and each is a joy. The seven-speed manual is slick, with a lighter clutch than before, and it immerses you deeper into the driving experience, with rev-matching on the downshifts to make you feel like a professional racing driver. The PDK gearbox also has seven speeds, and makes the 4S accelerate even quicker. The changes are smooth and lightning fast, and the set-up is a real boon if you spend most of your time in traffic. With all this pace you might think the 4S would be a real handful, but no; even in the wet it’s surefooted. 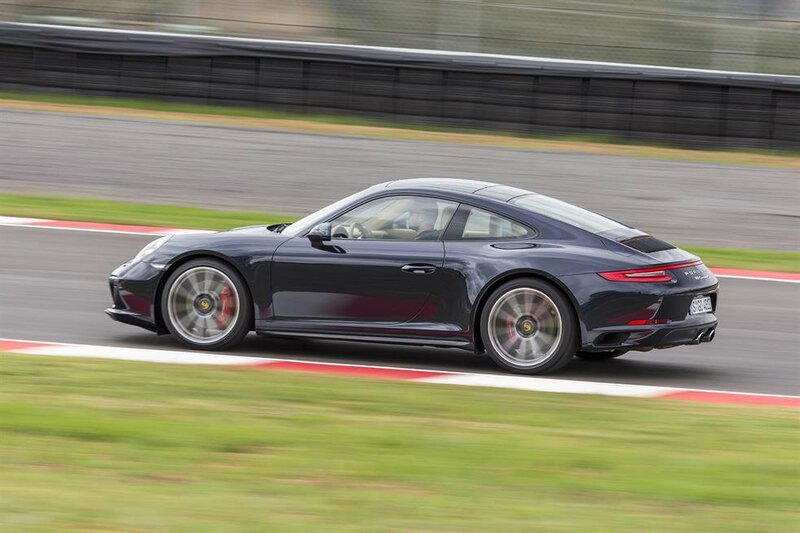 Coming out of corners you can accelerate earlier and faster than would be the case in two-wheel-drive 911s, but it still feels engaging to drive, and nimbler than the Jaguar or BMW. In the sportier driving modes the standard sports suspension – lowered by 10mm in the 4S – and adaptive dampers keep the car planted at all times. Turn into a corner and you feel the steering wheel weight up in your palms, letting you know how much grip is available. On the flipside, the Carrera 4S achieves that other 911 trait of being easy to live with when you want to amble along. In the softer Comfort setting the suspension is remarkably supple over all surfaces. At speed, there’s very little wind noise, although the wide tyres do generate quite a bit of noise over rough surfaces. What’s 2016 911 Carrera 4S Coupe like inside? In the rear, it’s a different story. Like the i8, only children can fit in the back seats, but that’s more than the two-seat F-Type can manage. When not in use the back seats can be used for extra storage to compliment the boot, which itself is roomier than an i8’s and about on a par with the F-Type’s. The new touchscreen infotainment system is a big improvement, and is more user-friendly than Jaguar’s similar touchscreen arrangement, but BMW’s iDrive beats them both - its rotary controller is far less distracting to use on the move. Blindspot warning is now an option, and to boost safety further, post-collision braking comes as standard, too. We can happily report that any fears you may have harboured about the new turbocharged 911s losing their edge are unfounded: the 911 Carrera 4S remains as desirable and entertaining as ever. It has a slightly different character now, but if anything, this makes it better in everyday use, and quicker, too. In fact, it comfortably out-performs both the Jaguar and the BMW, and despite the price rise, in manual form it's the least expensive of the three. As a package though, the Carrera 4S Coupe remains the most polished, capable, and the easiest to live with. It’s the one we’d recommend, with just one caveat: if you don’t need four-wheel drive, the Carrera 2S is cheaper, and even better still.